Open concept workplace layouts may lower the barriers for cooperation and teamwork, but with fewer walls you also get more noise and more interruptions. For office workers who spend any amount of their day on the phone, this extra noise pollution can lead to a decrease in productivity and an increase in frustration. Michelle Burbick, associate editor for NoJitter.com, digs into the problem and the solution put forth by Plantronics in a recent blog post. Ms. Burbick, the team here at BTP and reviewer Bill Hentschell at Legit Reviews all agree that Plantronicsâ€™ new Blackwire 725 UC headset is just the thing to restore sanity to a noisy workspace. 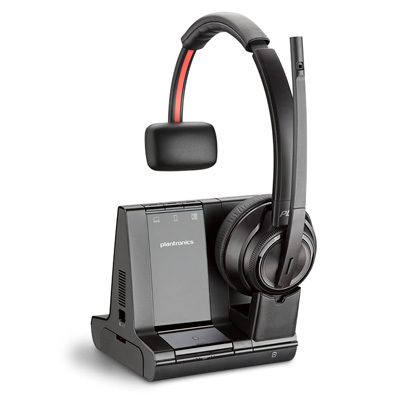 Plantronics Blackwire 725 uses Active Noise Canceling (ANC) technology to combat ambient office sounds. How does the Blackwire 725 headset fight office noise? There are two types of noise canceling being utilized. One is ANC technology that is built into the Blackwire 725 USB double ear headset. This type of technology is best at isolation and canceling out steady ambient noise and more low frequency sounds. A good example of this type of ambient sound is the constant engine noise when you are flying. Higher frequency noise is best canceled using passive noise reduction or isolation, which is created by the coupling of the headset ear cushions to your ear. Leatherette ear cushions on a headset do a much better job of this than foam. When you have ANC combined with good passive noise reduction in the headset and you join that with an additional audio path such as music, multimedia or call audio, nearby noise is effectively canceled for the user. The noise canceling helps you hear callers better, and with a directional microphone, it also helps your customers hear you without the background noise. Letâ€™s face it – if the marketing group is loudly playing wastebasket basketball near your desk, you probably donâ€™t want your best client hearing them whoop it up. And thatâ€™s not all: Plantronics also recently released Voyager Edge UC, which is an on-ear Bluetooth device with business-quality noise canceling. So if your organization is going to an open layout, keep these new audio technologies from Plantronics in mind. Youâ€™ll save productivity and probably a bit of sanity as well. If you have questions, be sure to call our Headset Help Desk for more information.